Here at St Andrews Links Golf Shops, we love colour and this year you will find a wide range of colour stories available from various brands (including our own). 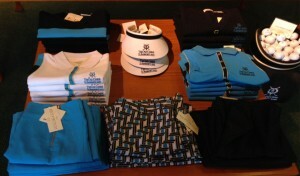 One colourful brand you will find at the Old Course shop is EP Pro. Each season EP Pro designs a range of collections which pair versatile colour palettes and patterns with the form and functionality of golf sportswear; effortlessly providing fashion suitable for both the course and the clubhouse. 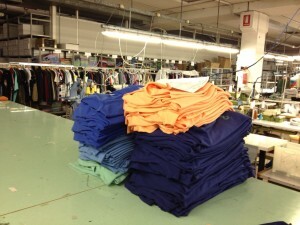 There are three colour stories available this Spring/Summer season. There is Cape May (as seen above) – a sugar sweet collection of Limelight Green, Candy Pinks and White. A fun preppy look! 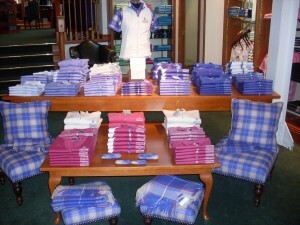 Our Old Course staff can be seen wearing pieces from this collection and they just love it. Stand out pieces from the collection are our Diamond Pattern V-Neck Pullover in fresh White with colour popping diamonds of Limelight and Candy Pink; the Tour Dry Ribbon Trim Polo in soft cotton jersey and flattering fit, with Gross Grain Ribbon framing the placket and accenting the sleeve; and the Mesh Check Cut Out Zipper Jacket which is airy and breezy, lightweight and simply irresistible – it can be thrown on over anything! For a bold and modern look, there is Mod Squad – available in Cherry, Black and White. With geo prints and houndstooth pattern, bold lines and colour blocking – and for the first time, the EP Pro collection also features a Little Black Dress (LDB), which is also available in Cherry. 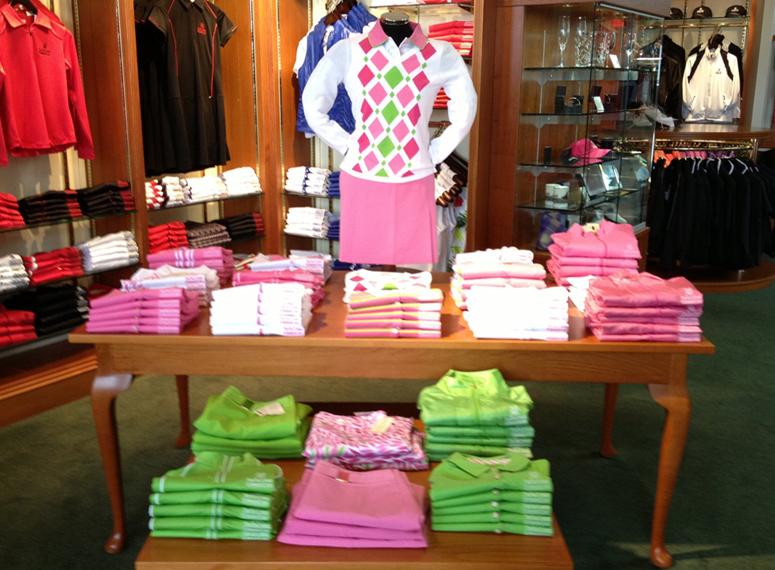 There are many ways in which to make a statement both on and off the course. We love the LBD in Tour Tech Jersey with sporty piping, zipper trim pockets and a slim fitting under short; the Jersey Knot Button Polo which comes in a luxuriously silky smooth fabric and unique knot buttons; and the Geo Print Skort in funky pattern with button tab waist. And finally, the tropical Hawaiian Punch made up of Iris Blue, and Passionflower Red and White. This collection is full of tropical fun with blooms appearing on Polo’s and patterned Skorts. Key pieces from this collection include the: Tour Tech Tropical Print Sleeveless Polo, which offers sun protection as well as a perfectly smooth fabric to enhance the tropical floral printing – a real stand out piece; The Water Resistant Vest is whisper weight and has a subtle check pattern that makes the tropical colours really pop; and the Stretch Sateen Tropical Floral Print Skort with its simple silhouette and fun pattern. 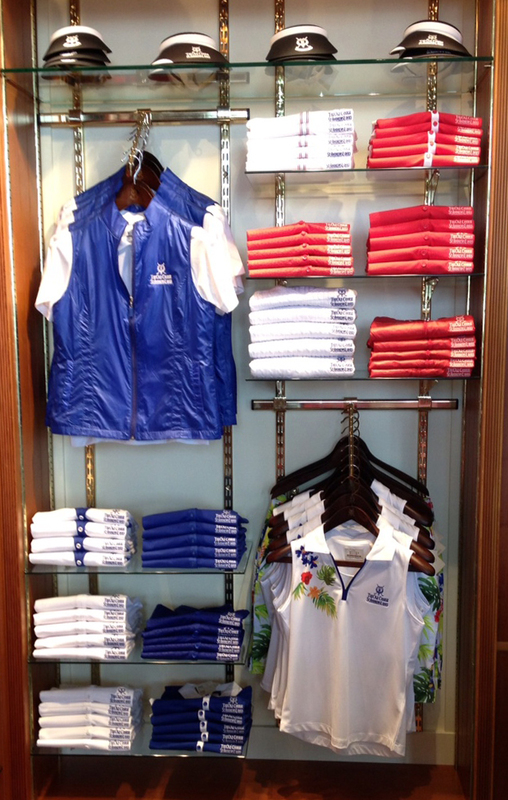 You can find each of the collections in the Old Course Shop. They really do look great in our EP Pro corner. Be sure to visit us soon to see it for yourself.